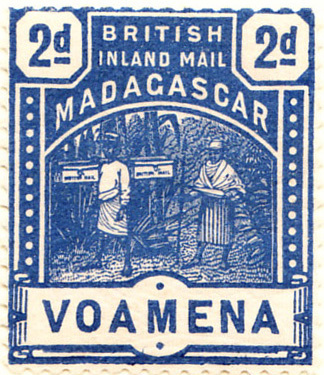 Madagascar: British Consular Mail for residents of the capital, Antananarivo, operated from 1884, using locally produced stamps. All 47 varieties in Gibbons are expensive and they do not appear to have been commemorated. 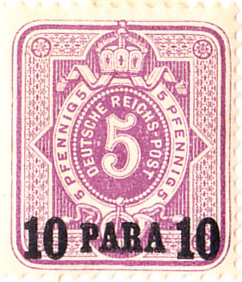 The stamps, in two designs, are rather mundane, apart from the factor of their size: they are probably the largest ever #1s and will thus have to be shown. The stamp shown is of the second design and sold on ebay for £3.99, described as 'damaged' and a 'spacefiller': my view is that as the stamps were only gummed in one corner, the tear adds authenticity and saves 95% of the catalogue price. 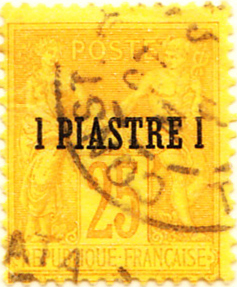 After 1887 the stamps were no longer used and the charges paid in cash. 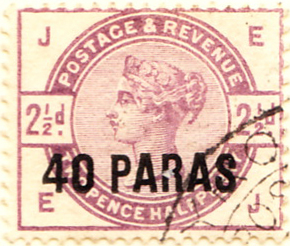 Alternative arrangements were made from 1895, British Inland Mail with two designs, the first plain, the second more interesting, picturing the runners who transported the mail. More on large stamps overleaf. And see French Offices. 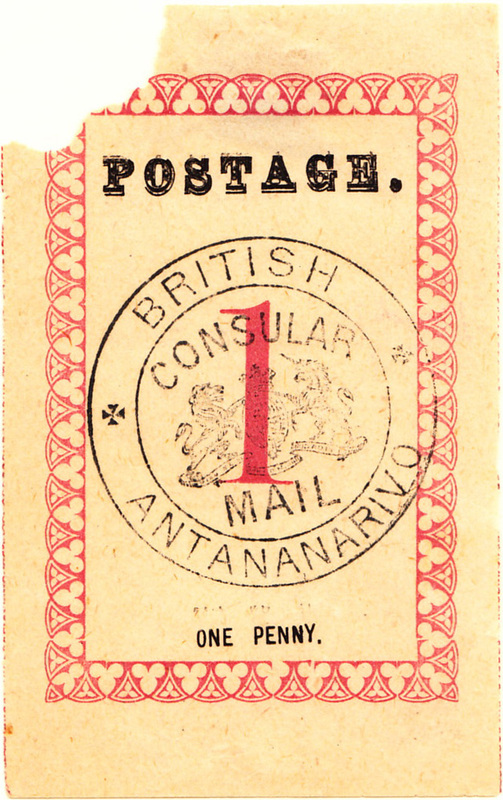 Similarly, there was British consular mail from Bangkok starting in 1882 using Straits Settlements stamps cancelled "BRITISH CONSULATE BANGKOK" and then stamps overprinted with a large "B". All are prohibitively expensive, in the hundreds and thousands, and so will not be shown.